I finally returned home late last night on yet another spooky flight from Prague with only 6 passengers, with departure from an empty apocalyptic airport in the Czech Capital, just like the airport in Brussels. Strange days. I ended up getting one of the first flights out of Barcelona. Destination Brussels and on to Prague, where I was scheduled to speak at the first National Bicycle Conference in the Ministry of Transport, together with Jan Gehl who unfortunately couldn't make the trip from Copenhagen due to the ash-ish. Wonderful to be home although my time in Barcelona was amazing. I was speaking at the 3rd Catalan Bicycle Congress in the city of Lleida before the ash attack forced me to take cover in a four star hotel across from the cathedral in Barcelona. Thank Odin for well-stocked mini-bars and a few thousand cafés/restaurants withing walking/cycling distance. Barcelona stunned me. 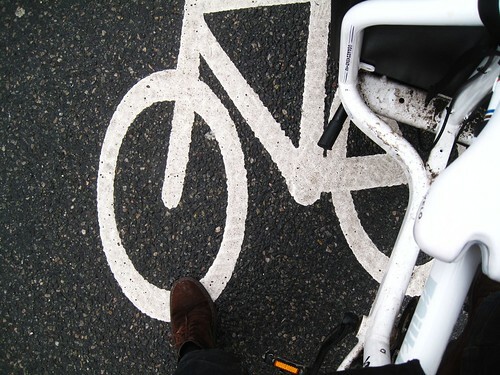 The city has gone from bicycle-non existent to bicycle metropolis in only 5 short years. It even makes Paris pale in comparison. Bicycles are everywhere, not least the Bicing bike share bicycles, on which I explored the city with friends. Txell from Barcelona Cycle Chic loaned me her card. I'll get back to Barcelona - because I have to and you have to hear about it - in coming posts. In the meantime, an amusing anecdote from this morning. Woke up tired but thrilled to see the kids. Presents were handed out accordingly and breakfast consumed. We hopped onto the Bullitt and headed for drop off duties at school/daycare. There is often a police officer at the roundabout on the corner where the school is located. I've never really figured out why and have assumed that they keep an eye on the crossing guards or the cars stopping to drop off kids. We were a bit early and the crossing guards weren't out yet. We rolled gently around the roundabout, with Lulu-Sophia in the box and Felix straddling the crossbar, like in the above photo, which is how we prefer to ride. There is a seat attached to the crossbar, visible in the top photo, for Felix to sit on if he's tired after football practice or something. The female police officer spotted us halfway round and I could see ants crawling into her police issue pants. We approached her and she waved us over. The first words out of her mouth had a nasal, hysterical quality. "That is an incredibly dangerous way to ride!" "No, it is not. 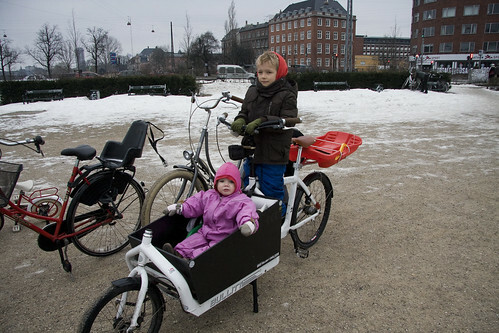 (Gud er det ej, in Danish)", replied the Danish Bicycle Ambassador. "No. It isn't." I replied, getting irritated. So far, there were no legal implications involved. It was only this individual's perception of safety and rationality that differed from mine. Which really shouldn't even be part of a conversation. Keep your personal fears to yourself. Afraid of flying? Fine. Don't fly. But don't tell me that I shouldn't. And don't bloody well stand there selling your fear within earshot of my children. Anyway, this agitated policewoman was glacing frantically around the Bullitt, looking for something to scold me about. "And... and... he isn't allowed to ride like that! ", she exclaimed, pointing to Felix. "Of course he is. This bicycle is fitted to accomodate passengers", said I, pointing at the bicycle seat attached to the crossbar. "He has to be strapped in!" "No, he doesn't. He's big enough and besides, you can't strap someone onto a bike seat." At this point I could see she was out fishing, far from dry land. "How old is he? ", she asked accusingly, trying suddenly and unsuccessfully to appear authoritative. "Oh... um... oh... well... um... then he's just barely over the edge...", she stuttered, meaning over the legal age for having to be 'secured' to a bicycle as a passenger, making it sound like we were THIS CLOSE to being guilty. She looked at Felix and said, "so you'll be riding your own bike next year", now trying to be cheerful. "I already ride my bike", said the boy indignantly - you don't diss an eight year old Copenhagen kid by suggesting he hasn't learned to ride - and I added, "What are you talking about? This is Denmark. He's been riding on the bike lanes since he was three and a half!" "Oh... um... well... then you get a high five..." she mumbled to Felix as she fidgited about, trying to get away. She forgot, however, to put up her hand for the high five and Felix didn't raise his. He just looked at her like she was strange. Which she was. She looked like she was about to say something else but then just turned on her heels and walked away, trying desperately to look busy and important. Little Lulu-Sophia, in the cargo box, asked with that charming questioning tone that two year olds have, "Wha wa dat?" "It was a casting call for Police Academy 4", I replied, even though the cinematic reference was lost on both of them. And off to school we went. What a collossal waste of time and energy, even though it only lasted two minutes. I'm quite sick and tired of such fear-mongering based on personal emotions rather than anything else. When it comes from a police officer, who should be balanced and rational, the irritation is magnified. Perhaps because they spend their days in cars they have been rendered useless in the cause of promoting cycling positively. When I got home I checked up on the traffic laws just to be sure. The Departmental Order of Bicycle Fittings and Equipment, which is a horrible translation of Bekendtgørelse af cyklers indretning og udstyr m.v. 1). Just to see if I was, indeed, a criminal in need of a fine and firm spanking. The Danish traffic laws for bicycles are at once ridiculously detailed in the rules about technical specs like reflectors, lights and size. Interestingly, there are rules about length and width of bicycles but none dicatating height - so bring on your Tall Bikes! Generally, any fine you recieve on a number of points are completely open to interpretation by the officer. Which makes it easy to go to court if you think the fine was wrongfully issued. Hans from Larry vs Harry has a friend who was had a fine overturned in court. He rode a long john with his daughter sitting on an upturned milk crate. She was secured by a rope. The officer was of the hysterical variety and a fine was issued along with a lecture. The judge, however, was more rational and the fine was overturned. 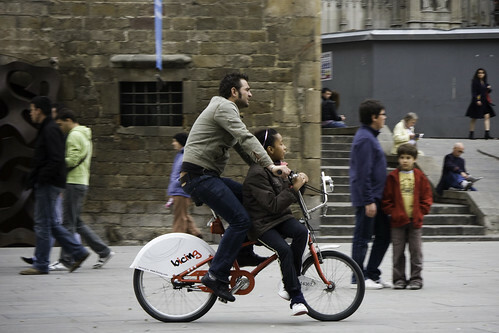 This entire episode was perhaps a notch more irritating as I have just returned from that most amazing cycle city Barcelona, where citizens ride freely and creatively through the streets, unhindered by obsessive and unecessary Nordic lawmaking.